Salade Nicoise with Albacore Tuna - A recipe from Savor California, the online showcase for extraordinary gourmet foods and beverages from California. Place the potatoes in a medium saucepan with enough water to cover, add the fresh chile, if using, and bring to a boil. Partially cover and cook for 30 to 35 minutes, until the potatoes are tender. Drain and discard the chile. While the potatoes are cooking, combine the wine, shallot, sugar and salt in a small sauce pan. Bring to a boil over moderately high heat and boil for about 4 minutes, until the wine is reduced by half. Stir in the vinegar and remove from the heat. Peel the potatoes, if desired. Cut into 1-inch chunks and place in a medium bowl. While they are still hot, spoon 1/2 the wine mixture over the potatoes and toss to coat. Set aside for 15 minutes; the potatoes will absorb the mixture as they stand. Add the thyme and lemon zest to the potatoes and toss. With a whisk vigorously stir the olive oil into the remaining wine mixture until well blended. Add the olives. Reserve about 2 teaspoons of the dressing, and pour the rest over the potatoes and toss to coat. Add plenty of freshly ground pepper and salt to taste. Toss the green beans with the reserved 2 teaspoons dressing. 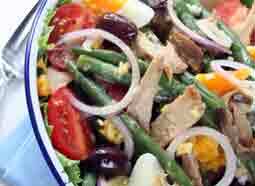 Arrange the salad greens on a large platter, then arrange the potatoes, green beans, tomato wedges, egg, onion rings and canned tuna on the greens. Top with the anchovies and capers. Drizzle any tuna can juices over the tuna and serve at once.